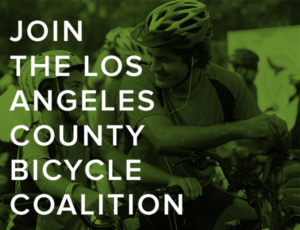 Tonight the Mar Vista Community Council will consider endorsing the Cyclists’ Bill of Rights, which has already been adopted by the L.A. City Council and a number of community councils throughout Los Angeles. 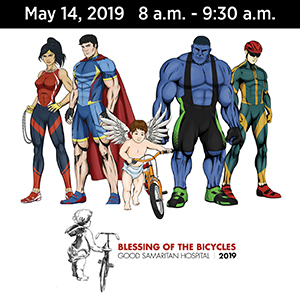 Appropriately, this bill is being considered during Bike to Work Week, yet it has met some resistance in committee, with some people suggesting that bikes belong on the sidewalk and others saying cyclists should ride in bike lanes or next to cars in parking lanes. I encourage you to go and speak in support of the bill if you can. Unfortunately, while I’d like to be there, prior commitments will keep me away. As a result, I’m writing the following letter, and will ask someone to deliver it to the council members for me. Just two months ago, my wife and I were stopped at the intersection of Palms and Sawtelle Boulevards — at the edge of this very park — when her car was struck by a hit and run driver, suffering over $5000 in damage. Fortunately, we weren’t seriously injured, since we had over 2,000 pounds of steel sand safety equipment to protect us. If we had been on bicycles at the time, we probably would have been killed. Some people would see that as an argument for why bikes don’t belong on the streets. They ask why cyclists can’t ride on the sidewalks, in bike lanes or within the parking lane. After all, in the event of a collision, the cyclist will inevitably lose — regardless of who is at fault. Yet that sort of “blame the victim” mentality puts the entire burden of safety on the cyclist, rather than on the operator of the more dangerous vehicle — which is exactly what a car is. Motor vehicle accidents kill over 40,000 people in the U.S. each year. The number of those killed by bicycles is close to zero; the number killed by cars, trucks and motorcycles approaches 100%. So the solution is not to remove bicycles from the street, but to insist that all drivers operate their vehicles in a safe and legal manner. While riding on the sidewalk is legal in Los Angeles, in most of the other cities in the L.A. area, it is not. On many sidewalks, the pavement is broken and uneven, making it dangerous for pedestrians and cyclists alike. At the same time, most are too narrow to safely accommodate both cyclists and pedestrians; ask any pedestrian if they want bikes whizzing past with little or no warning. At the same time, sidewalks are inherently dangerous for bicyclists. Aside from the inevitable conflicts with pedestrians, riding on a sidewalk requires the cyclist to cross the street at the end of each block, directly into the path of any drivers making a right turn or approaching from the cross street. Most drivers look for bikes on the street; they don’t expect to see them dart out unexpectedly from sidewalks, where they can be hidden by plants or other objects. So rather than making bicyclists safer, riding on the sidewalk dramatically increases the risk of a serious accident. As for bike lanes, the current system of biking infrastructure in the city is woefully inadequate — just one of the things the Cyclists’ Bill of Rights was written to address. I challenge anyone to create a route from Mar Vista to Downtown — or virtually anywhere else — using only designated Class 1, 2 or 3 bikeways (off-road trails, on-road bike lanes or unmarked bike routes). And many of the Class 3 bike routes are actually among the most dangerous places to ride, such as the one along Pico Boulevard between Sepulveda and Overland. While the parking lane would seem to be a safe place to ride, since it removes the cyclist from the driving lane, it is actually a very dangerous place for cyclists. Too many drivers fail to adequately check their mirrors and blind spots before pulling out of a parking space, failing to see cyclists who could be hit by their cars or forced into traffic to avoid a collision. An even greater hazard comes from drivers who carelessly open their doors without looking. Known as “dooring” by cyclists, this can cause a bicyclist to collide with the door, often resulting in serious injuries, or if the door strikes a rider, it can knock him or her over — directly into the path of oncoming traffic. Even a near miss can result in a serious accident by forcing riders to suddenly swerve into traffic, greatly increasing the risk of a collision. 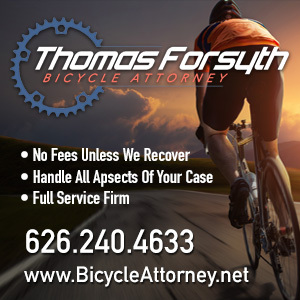 State law already guarantees cyclists a place on the roadway, wisely leaving it up to the rider to determine exactly where and how to position themselves for maximum safety. In fact, there is nothing in the Cyclists’ Bill of Rights which is not already taken for granted by other road users, from the right to travel safely and free from fear, to law enforcement aware of all applicable rights and regulations, and a place to park at the end of the journey. All it does is guarantee to cyclists the same privileges and conditions any driver would expect, and the same rights any citizen of this country is entitled to. 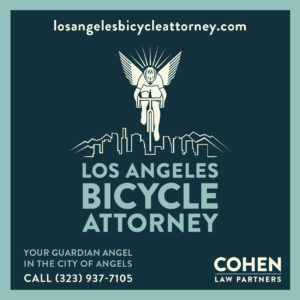 I urge you to support safe, free and fair bicycling in Los Angeles, and endorse the Cyclists’ Bill of Rights. Catching up on last week’s reading: Will Campbell channels his inner Dashiell Hammet to invent the new literary category of Bike Noir, while a novelist in Scotland discovers there is such a thing as bad weather; she also notes a new, slim volume of bike poetry. An Eastside cyclist wonders why he still gets harassed when he’s less of a problem than Critical Mass or the Ridazz. Damien Newton discovers that sometimes a bike lane is just paint on the street. Texas considers a safe passing bill. The Xtracycle moves up the coast to my neighborhood. Esquire notes the possible end of car culture, while Bicycle Fixation observes the rising tide of cyclists; even bank robbers prefer bikes these days. LA Eastside offers recent photos of the Ghost Bike for Jesus Castillo. Finally, in case you missed the links in last weeks rant about Santa Monica’s new designation as a Bike Friendly City, Russ Roca tells a tale in five parts of being ticketed for riding safely — and legally — in similarly bike friendly Long Beach, here, here, here, here and yes, here.